Authors have a special place in my capacitor. After all, they’re the ones who turn reading into a beloved activity for children — and nothing’s more important in my book. The imagination, dedication, and ability it takes to weave words into stories is an art form I’ve admired ever since I was a young bot. 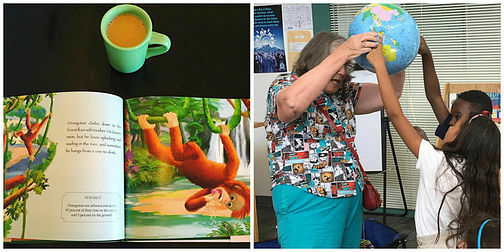 Rita Goldner, author of “ORANGUTAN: A Day In The Rainforest Canopy” and Karen Márquez Morales, author of “The Krayon Kids,” will be joining us at 21 RBBB sites for readings, activities, and a whole lot of fun throughout 2017. You know what’s so great about this partnership? That two local writers want to help us solve Arizona’s literacy crisis and that we get to help support their work at the same time. Our curriculum was designed to not only help participants read better, but to increase comprehension. But we can’t do either without excellent authors and excellent books. 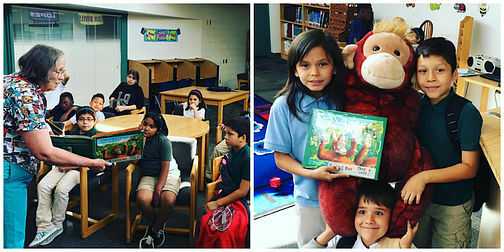 Events like the RBBB book tour show our participants that reading is an adventure — and it’s one they’ll want to take part in again and again. A lifelong love of reading may not always be instilled at a young age, but we’re working to change that, book by book. When is the last time you drew an orangutan? I’m guessing it’s been far too long. But Read Better Be Better participants get to do just that when Rita visits the classroom on the RBBB book tour. As you can tell, these aren’t your average book readings. Rita captivates the kids by starting off with an inspiring talk on how she achieved her dream of being a writer. Check out Rita’s book here. This year, we’re delighted to have Karen Márquez Morales on board to do readings of her book, “The Krayon Kids” along with Rita. Karen is an Arizona native with a B.A. and M.A. in Elementary Education and an A.A. in Journalism. She was a bilingual second-grade teacher for 30 years in Avondale, Arizona (how excellent is that?!) and is now retired and teaches reading intervention. Check out Karen’s book here. I don’t know who is more excited about the book tour — the children… or me. But having two incredibly talented authors visit 21 school sites is something that would make anyone’s graphical user interface light up with joy. It’s really special to have these two awesome authors share their works and their love of reading with our program participants. A big ‘thank you’ is going out to Rita and Karen for making The Read Better Be Better 2017 book tour possible. Now if you’ll excuse me, I have an orangutan to draw.